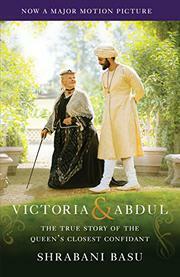 The story of the Indian man who took the place of John Brown in Queen Victoria’s life and heart. Basu (For King and Another Country: Indian Soldiers on the Western Front, 1914-18, 2016, etc.) had access to heretofore unseen documents, letters, and interviews regarding Abdul Karim (1863-1909) and his controversial relationship with the queen. Upon the queen’s death in 1901, King Edward VII immediately sent for all of Victoria’s correspondence, which they burned promptly on the spot. In 1887, Karim traveled from Agra to England as part of Queen Victoria’s Golden Jubilee celebration to showcase Britain’s empire. He was one of two Indians chosen to be servants to the queen, though he looked more like a nawab (a kind of Indian prince) than a servant. Eventually, he became a munshi, a teacher or counselor. Though she never visited, Victoria loved India, and many Indian princes attended the jubilee and were given pride of place at the table. Victoria also loved to show off her Indian servants to other European nobles during her annual spring vacations on the continent. Karim quickly endeared himself to the queen, telling her stories of India, cooking curries, and teaching her his language. Their daily lessons enabled her to read and write Urdu and to greet visiting maharajas in their native tongue. Of course, the queen’s household and the other servants were quick to grumble as jealousy and outright hatred grew. In class-conscious England, the author ably shows, Karim overstepped all bounds. He was not just a munshi; he influenced political affairs, was served with the household rather than the servants, and was given cottages for his own use. Karim gave Victoria someone to talk to; like John Brown, he lifted her spirits. In a book packed with names and hierarchy, Basu helpfully includes a dramatis personae and a family tree. King Edward’s success in repressing stories of one of Queen Victoria’s advisers has now been overturned with solid research and crisp, clear writing.